Rivi was, for a time, the hit-man of choice for Griselda Blanco, aka the Black Widow. Griselda was the grande dame of the Miami cocaine business, a Colombian mother of three, of impoverished origins, who slaughtered and intimidated her way to the top of a billion-dollar industry. She is a central character in this movie, the most deadly figure in a story in which the bodies are stacked like dominos. Conspicuous by her absence as an interviewee, she is one of the few key survivors of the era whom the film-makers were unable to coax before the lens. “Her release was imminent at that point, as was her deportation. I think she has changed her mind since, because we have been reapproached,” Corben says. Rapid-fire editing unleashes an onslaught of information. This is documentary-making for ADD sufferers and has now inspired a feature film to star Mark Wahlberg, based on the the drug dealer Jon Roberts, featured in Cocaine Cowboys. Corben, a Miami native with a conversational style like a runaway train, acknowledges the drug’s influence on Cocaine Cowboys’ aesthetic. “My intended effect was that after this movie, you felt like you had been on a bender.” Besides Griselda and Rivi, the key characters in the film are Roberts and Mickey Munday. They are the “cowboys” of the title, two outlaws who imported but didn’t sell the drugs. The way they tell it, their clever smuggling methods transformed the fortunes of the once sleepy backwater of Miami. I Enjoyed Cocaine Cowboys And in consideration He was the best enforcer on USA Soil. Disturbing comments like the last one make me fear for our society. 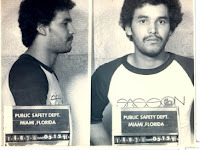 I am intigued by the whole story of the Cocaine Cowboys. Jorge "Rivi" Alyala, Griselda Blanco, Roberts, Munday and Charles Cosby. Im alway,s looking now for more information on Griselda Blanco for my curiosity on how she came to be so powerfull amongest the whole Medillin cartel. I thought she was a common peasant child from the era of "La Violencia", to a prositute, to marrying Bravo being small street dealers to moving to N.Y importing more then any before. I was amazed after the killing of the "Ochoa" woman, how did she still get a pass from Colombia??? Without Griselda's testimony there are too many empty holes that needs filling to this whole Cocaine Cowboy story... I woud love to meet the Godmother herself to interview her and hear her story.... Wow im a lost for words! Gotta give Griselda her props! Ella es la Madrina!